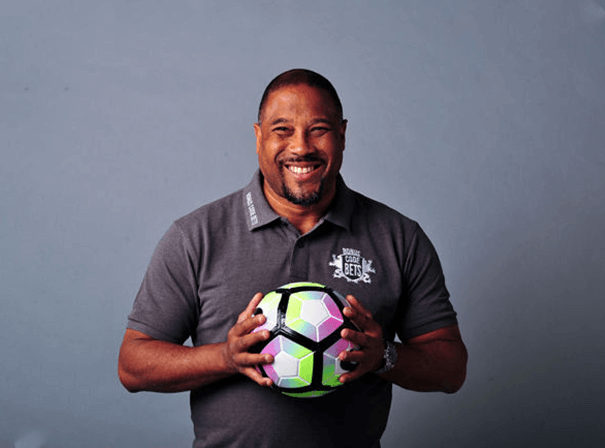 Retired Jamaican born English footballer John Barnes is a cherished sports personality available for broadcasting opportunities, TV and personal appearances as well as after dinner speaking opportunities. Currently working as a pundit for ESPN, John has also worked for Channel 5 presenting their football coverage, and also had a brief period in coaching. It was during the 1999–2000 season with Celtic and saw John work alongside Kenny Daglish. He also managed the Jamaican national team in 2008 as well as Tranmere shortly afterwards. During his playing career, Barnes played with Watford and Liverpool throughout the 1980s and 1990s, accolades include scooping the First Division twice, the FA Cup, also twice, and being the most capped Black player to have turned out for England a total of 79 times. Later John Barnes had spells with Charlton Athletic and Newcastle United. Barnes saw the most success with Liverpool, playing 314 times and scoring 84 goals in that time. John is something of a cult legend for his 1990 world cup song ‘World In Motion’ sung with other members of the team as well as Manchester band New Order. Regularly cited as one of the most skilled and talented English players to play the game, Barnes was voted Football Writers’ Association Footballer of the Year, twice, and also won the PFA Players’ Player of the Year.